This article provides the step by step guide of how to add, update and remove contacts from a contact lists. Step 1. Navigate to your contacts by going to Contacts > Browse Contacts. Step 2. To add selected contacts to a list, check to select the desired contacts. 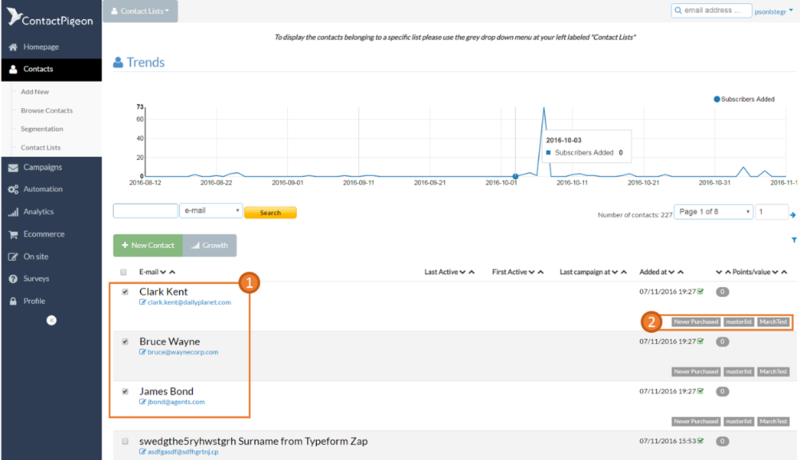 You can also use the search feature to find a specific contact. Select the contacts you want to add to a list by checking the boxes next to the names. Step 3. Scroll to the end of the page. Use the drop down menu to select the target list you'd like the contacts to be added to. Alternatively, to copy all of the available contacts to the target list, click "Copy all"
"Delete selected from contacts" will remove the contacts from the platform -- NOTE: THIS ACTION IS NOT REVERSIBLE! This process is very similar to the previous Add Contacts to a List. This process allows you to move or replicate contacts between 2 lists. Step 1. 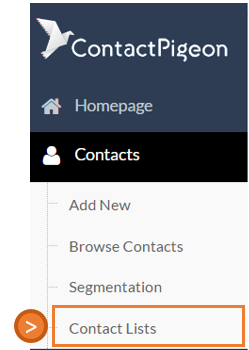 From the left side menu options, select Contacts > Contact Lists. 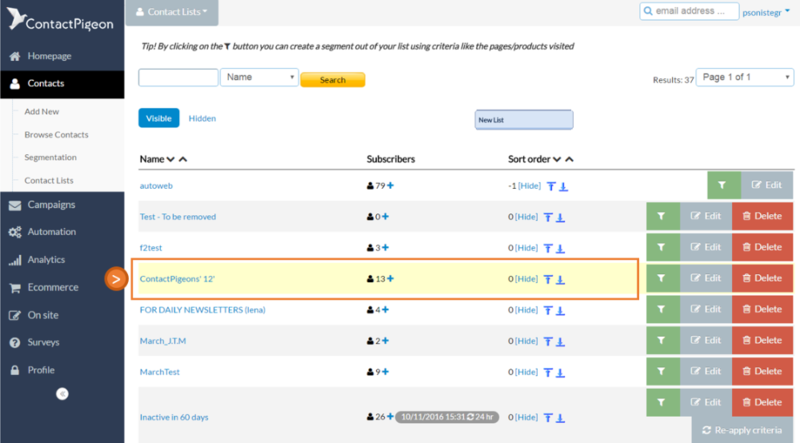 This brings you to a set of all visible lists you have within the platform. Step 2. Select the list which you would like to move or copy the contacts FROM. Step 3. To add selected contacts, check to select the desired contacts. You can also use the search feature to find a specific contact. Step 4. Scroll to the end of the page. 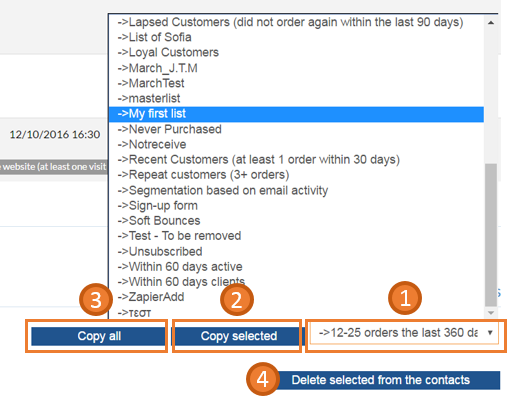 Select target list - Use the drop down menu to select the target list you'd like the selected contacts to be moved or copied to. Move all - This function moves all the contacts within the original list into the destination target list. This removes all contacts from the original list. Move selected - Moves only the selected contacts to the target list. This function removes the selected contacts from the original list. Copy selected - Makes a copy of selected contacts into the target list. Contacts remain in the original list as well. Copy all - Copy all of list contacts to the target list. Contacts remain in the original list as well. Remove selected - Remove selected contacts from the original list. This function does not delete contacts from the ContactPigeon platform. Delete selected from contacts - Permanently deletes selected contacts from both the list and the platform -- NOTE: THIS ACTION IS NOT REVERSIBLE!